Investing in a structured settlement buyout can be done essentially in 3 ways. Buying out the structured settlement from the original holder of the payments rights. This is done by a secondary market factoring company. Serving as the intermediary between the buyout company and another party who wants to invest in the future payments. He is buying it out from the first buyer. You are the broker. Investing in the buyout. You are buying the future payments from the factoring company - with or without the aid of a broker - who purchased it from the original holder. Let's see some examples and illustrations. Here is how it works. Let's start with the first scenario. 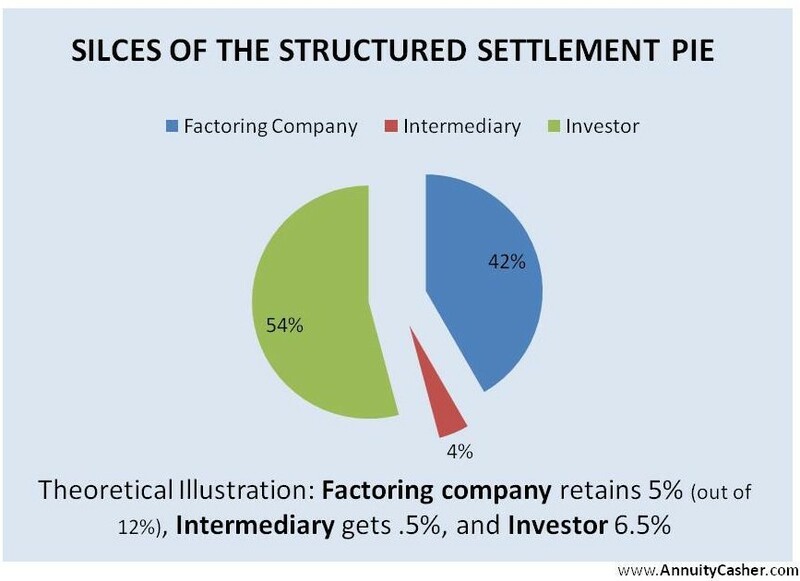 You are the factoring company buying out structured settlement payments rights. You are contacted by a seller who wants to sell her structured settlement. You buy it from her at a discount rate of 12%. She'll get from you a lump sum amounting to far less than the sum of her future payments. Why? Because the higher the discount rate the lower the resulting amount of money. That would be exactly the same amount as the original compensation amount she was awarded before the growing interest gains of the future payments. But because a 12% discount rate is employed, the lump sum would amount to much less, actually like reverse of future payments with an interest yield of 12%. That means that you'll gain on the transaction the difference between the lump sum that you are paying to the seller and the total amount of the future payments (minus whatever you'll pay for attorneys and other fees). Your profits will be way more than the yield on the future payments (that as we recall, would usually be very low). However, you had to invest money, and you'll have to wait for the future payments to receive your return on investment. You'll not reap a profit before your proceeds of the future payments will exceed what you paid in the lump sum to the seller. You can choose to sell the structured settlement to others and get your profits now. In this case, your profits will be less because the buyer will have to profit on it too. 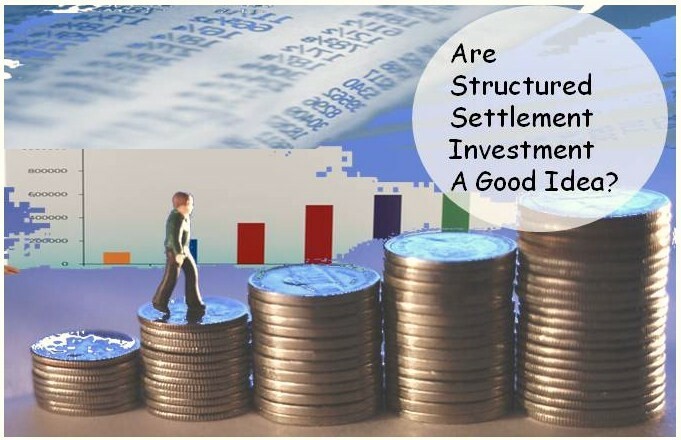 As a broker of structured settlement buyout investments you are mediating between the buyout company and the investor who is willing to buy the structured settlement from that company. The factoring company will sell it to you at a certain discount rate, let's say 7%. This is a lower discount rate than 12%. Let's recall that the lower the discount rate, the LARGER the amount. The factoring company will get its money now instead of having to wait for future payments. Its profits will be less than before - more precisely, the difference between the 7% discount rate and the present value (future payments minus 2%-3%, for example, on the compensation award of the original holder), minus the fees involved in the original buyout from the first holder. You, the intermediary, now keeps the rights of the future payments, but you want to get profits now, so you sell it further to an investor, for a slightly lower discount rate, so that you can reap a profit too. Obviously, as the broker you don't want to keep it for the future payments but sell to investors. In this case, you contact or are contacted either by a factoring company or by a intermediary and offered the structured settlement buyout to keep future payments. Here you are not the original buyout company, nor are you the broker. You are an investor. You pay a certain amount to buy the settlement or part of it, and you keep the payments rights. You will get your profits later on from the future payments. Your profits will be the rest after taking off the part of the factoring company as well as the broker. You will be offered the structured settlement rights for a certain interest percent. This percent will be more than the profits of the original holder by the yields of the future payments (that, as we remember is usually low), because the factoring company bought it out from her at a deep discount, so there's money here to make. However, the original holder did not "invest"; she was awarded it, perhaps as compensation for a personal injury, but you do have to pay money and invest in exchange for the return on investment. In scenario #2 and #3, you don't pay the attorney fees, however, and are not involved in the court process for the structured settlement buyout transfer from the original holder. This is done only by the factoring company, the first buyer.